Coined in 2009, the term Software Defined Networking (SDN) has gained significant momentum in the last years. SDN’s promises to enable easier and faster network innovation, by making networks programmable and more agile, and by centralizing and simplifying their control. Even if some SDN’s programmable networking ideas date back to the mid of the 90s, and do not nearly restrict to device-level programmability and to OpenFlow, it is fair to say that OpenFlow is the technology which brought SDN to the real world. The separation between control and data plane is highlighted as a distinguishing feature of SDN, and sometimes even postulated as the SDN definition itself. But should such a separation necessarily take the form of a physical separation, namely a “smart” controller (or network of controlling entities), which runs the control logic for “dumb” switching fabrics? This was the case with the original OpenFlow, as its “match/action” programmatic abstraction necessarily resorts on an external controller for (reactively or proactively) updating forwarding policies in the switches’ flow tables. Recently, the possibility of enriching the programmatic abstraction of OpenFlow to allow forwarding rules to evolve over time without directly involving the controller has emerged as a major trend in SDN research. This requires an evolution of the data plane that allows incorporating the ability to execute some kind of logic for reacting to events and modifying rules. 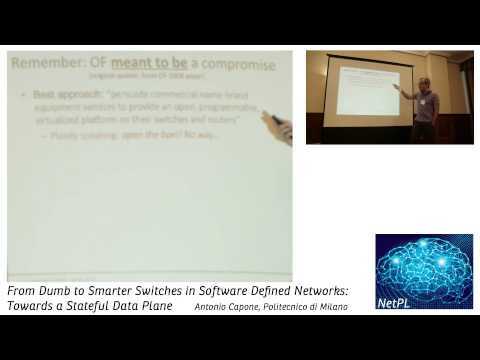 This talk will discuss potential limits of SDN applications fully based on controllers and provide an overview of a new stateful data plane abstraction. Antonio Capone is a Full Professor at the Information and Communication Technology Department (Dipartimento di Elettronica e Informazione) of the Technical University of Milan (Politecnico di Milano), where he is the director of the Advanced Network Technologies Laboratory (ANTLab). Dr. Capone is co-founder and CTO of MobiMESH, a spin-off company of Politecnico di Milano. His expertise is on networking and his main research activities include protocol design (MAC and routing) and performance evaluation of wireless access and multi-hop networks, traffic management and quality of service issues in IP networks, and network planning and optimization. On these topics he has published more than 200 peer-reviewed papers in international journal and conference proceedings. He received the M.S. and Ph.D. degrees in electrical engineering from the Politecnico di Milano in 1994 and 1998, respectively. In 2000 he was visiting professor at UCLA, Computer Science department. He currently serves as editor of ACM/IEEE Trans. on Networking, Wireless Communications and Mobile Computing (Wiley), Computer Networks (Elsevier), and Computer Communications (Elsevier). He was guest editor of a few journal special issues and served in the technical program committee of major international conferences (including Mobicom, INFOCOM, SECON, MASS, Globecom, ICC, LCN, Networking, WoWMoM), as Technical Program Chair of Ifip MEDHOCNET 2006, Poster&Demo co-chair of SECON 2009, Workshop chair of INFOCOM 2010, publicity chair of MOBIQUITOUS 2007, general co-chair of WONS 2011, area chair of INFOCOM 2012, TPC co-chair INFOCOM 2013. He is currently involved in the scientific and technical activities of several national and European research projects, and he leads several industrial projects. He is a Senior Member of the IEEE.